Bus from Melaka to KLIA or bus from Melaka to KLIA2 is one of the highly sought-after bus services in Melaka Sentral and Mahkota Medical Centre. The bus service does not only serve the foreign tourists going to KLIA/KLIA2 airport, but also Melaka residents going abroad. Malacca as the UNESCO world heritage site attracts thousands of tourists coming to Malaysia who will definitely visit Malacca for its historical buildings. After spending their holiday in Malacca, taking a bus from Melaka to KLIA or a bus from Melaka to KLIA2 is the most convenient and economical transportation option to reach the airport to catch the flight back to their home countries. Transnasional and Starmart Express are the only operators serving bus from Melaka to KLIA/KLIA2. With a total of 29 departures daily, passengers can choose the schedule that best fits their convenience. Out of those, 9 schedules depart from Mahkota Medical Centre while the rest depart from Melaka Sentral Bus Terminal. 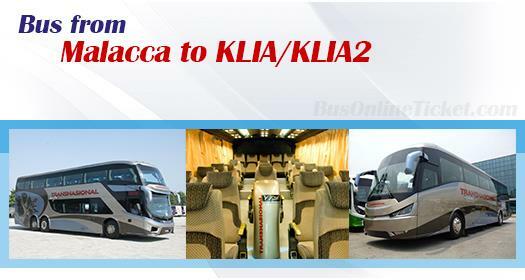 This service of bus from Melaka to KLIA or bus from Melaka to KLIA2 is convenient because passengers do not need to travel to Kuala Lumpur to transfer to a shuttle bus to reach KLIA or KLIA2 airport. Therefore, even though the bus fare for bus from Melaka to KLIA/KLIA2 is at RM 24.10-RM 35.00, which is almost double of the bus fare from Melaka to KL, it does not stop people from taking this convenient bus service from Melaka to KLIA or KLIA2. The travel duration for bus from Melaka to KL is about 2.5 to 3 hours depending on traffic condition. The coach will travel directly from Melaka Sentral or from Mahkota Medical Centre to KLIA/KLIA2, depending on the selected schedule. Passengers who catch the flight are advised to spare more time on the road because road traffics are always unpredictable. It is always better to book the ticket online in advance at BusOnlineTicket.com to avoid disappointment, especially during festive seasons. BusOnlineTicket.com accepts foreign credit card which makes booking easier for foreign tourists coming to Melaka.